Revoltage now enters the next phase, where in 2018 we have taken steps to introduce the new logo of Revoltage in a more minimalist and unpretentious style. Hopefully with the new face of Revoltage it will have a positive impact in order to move forward in any situation. This more minimalist and simpler logo still maintains the spartan concept in the previous logo which means the spirit of heroism to continue to fight in any form of circumstances to move forward in the field of esports in particular and in general life. The spartan helmet design that brings the elements of the letter “RV” is synonymous with tags used by the Revoltage in each participating tournament. 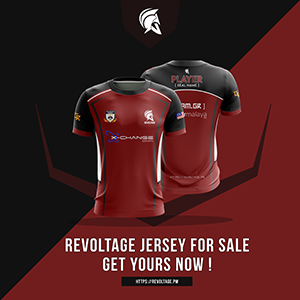 The Revoltage jersey is also more minimalist, neat and most importantly, in the design of its own class. It combines the three main colors for Revoltage’s team of red, black and white. The order of logos that are more organized and in line with the particular sequence is highlighted this jersey. For pre-order, please click the button below. The price is RM70, order now before it’s too late! The closing date for the pre-order will be notified. First 100 orders will receive a free gift consist of X-Change Cyber Café voucher and Revoltage sticker!! !